The opposition has been a revolution against the shame that victims of sexual violence carry and trauma that erodes our communities. The confirmation of Brett Kavanaugh to the Supreme Court, an appointment made by a president who admitted on tape to sexual assault, is one of our country’s greatest moral failings, but one that none of us should find surprising. Sexual violence is about power, and what we have seen in our culture is a function and extension of entrenched power dynamics. Kavanaugh's confirmation yet again reflects a political system that is built upon and reinforced by a set of toxic masculine principles. For perhaps the first time, a majority of Americans is coming to realize that, as Audre Lorde said, "the master's tools will never dismantle the master's house," and the time has come to raise a new house (and Senate, for that matter). Thus, it is time to raise a new generation of leaders. The elected officials who facilitated yet another man accused of sexual misconduct achieving a lifetime appointment to the Supreme Court should be held accountable and lose their jobs — but this fight has a broader place in history beyond simple election cycles. The FBI investigation into Kavanaugh didn't bring Dr. Ford justice. Sexual assault survivors like me aren't surprised. Real progress must include respecting the humanity of survivors of sexual violence, whose leadership continuously drives our culture forward in spite of their continuous marginalization and denigration. The predominately white and male institutions of power must shift and evolve beyond the present standards to address sexual violence. Our culture has to embrace the complexities of changing, and to accept that both change and accountability cannot occur without hurt feelings. This type and depth of change cannot, nor should not be easy. The impact of sexual violence should be placed at the center of our public debate, because the resistance to this broken piece of our culture should never have been partisan and the work to change it is only just beginning, despite decades of activist effort behind us. We need to tell a new story about what change looks like and it looks like this: To never stop fighting for the humanity of survivors are to be seen, valued and believed. That is what it means to fight for a country where we all get to thrive, and for one that shifts the burden of shame away from those who have survived sexualized violence and toward those who are complicit in the continuity of that violence. The current national reckoning over the Kavanaugh nomination has been a revolution against the shame that survivors are burdened to carry and trauma that erodes our communities. Taking sexual violence seriously is the moral fight of our generation and what has unfolded over the last few weeks is the messy, complicated and necessary work required to meet this moment. The Kavanaugh confirmation fight broke the norm that sexual trauma and the long-term, emotional impacts of sexual violence should not be seen or spoken. Every story shared, every testimonial, every angry voice raised, each and every moment where we as a country bore witness to our collective humanity and glaringly absurd double standards to which men and women are held was a rejection of shame and a spark toward new era of leadership. There are models for building this new world. "We have to make decisions, like, yeah, that does disqualify you from being a Supreme Court justice if we find that you have been sexually abusive," she said. "Recognizing it, acknowledging it, bringing women into the process as full participants who can testify honestly about their experiences, and then being willing to make hard decisions." Mukwege, a Congolese physician who leads a hospital treating tens of thousands survivors of brutal sexual violence in eastern Democratic Republic Congo, has continued his work to help women heal in the face of death threats and assassination attempts, “Our society has to say stop and draw a line in the sand: Some acts are such that society as a whole must oppose them,” he said of his mission. Murad and Mukwege are models to survivorship as leadership, where bearing witness and giving voice to hard truths catalyzes necessary change. Mukege’s Nobel acceptance speech reflects this, "To the survivors from all over the world, I would like to tell you that through this prize, the world is listening to you and refusing to remain indifferent. The world refuses to sit idly in the face of your suffering." It's never been that we don't know how to change a world that treats women's bodies as commodities for men to amass; it's that we've often deemed it too inconvenient to even try. 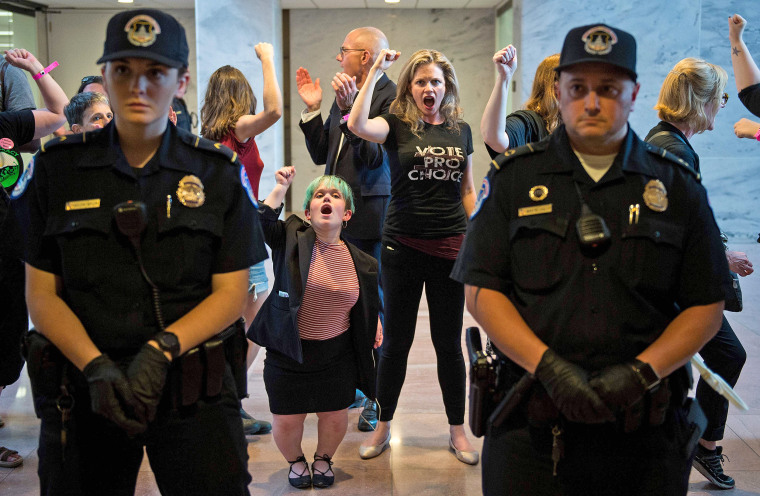 Women who are tired of their autonomy being inconvenient, however, may have been defeated by Kavanaugh's confirmation but we are prepared for more fights. We are beleaguered, as a nation, by the pain and trauma this nomination process has dragged into the public square; that is not dissimilar to the exhaustion that every survivor has felt at the weight of a culture that maligns, marginalizes and erases their pain. We are wearied by the systems of power that have tacitly supported and enabled the expansion of that pain. The cost of sexual misconduct should not be paid by survivors anymore. This ugly chapter will be seared into the moral conscience of this country; this confirmation was a moral test we failed. And while we figure out how and why, we need to also think about tomorrow and ask what the leaders we are raising today will need from us for the outcome to be different next time. Sabrina Hersi Issa is an award-winning human rights technologist and CEO of Be Bold Media. She organizes Rights x Tech, a gathering for technologists and activists, runs Survivor Fund, a political fund dedicated to supporting the rights of survivors of sexualized violence, and serves as a Venture Partner at Jump Canon.